Vasant Panchami, also known as Basant Panchami, is a Hindu spring festival as ‘Basant’ is a synonym of ‘Spring’. Vasant Panchami is celebrated every year on the fifth day of the bright half of the Hindu luni-solar calendar month of Magha, which typically falls in late January or February. It is treated as the start of spring, though it is generally winter-like in northern India, and more spring-like in central and western parts of India. 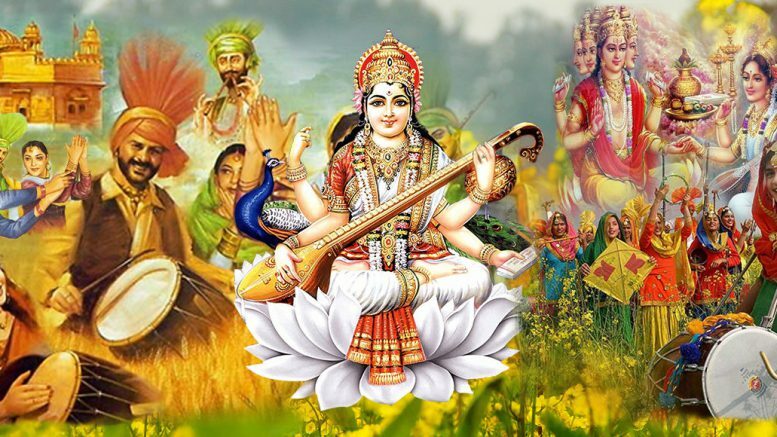 For many Hindus, Basant Panchami is the festival dedicated to goddess Saraswati who is their ancient goddess of knowledge, language, music and all arts. The season and festival also reflects the agricultural fields which are ripening with yellow flowers of mustard crop, which Hindus associate with Saraswati’s favorite color. People dress in yellow saris or shirts or accessories, share yellow colored snacks and sweets. This festival is also celebrated in educational institutes – schools and colleges – where students and teachers, wearing new clothes, pray to the goddess of knowledge and organize various programmes of song and dance. In Punjab, devotees celebrate by flying kites on their rooftops while in Rajasthan, people wear jasmine garlands on the day of the festival. In southern states such as Andhra Pradesh, the same day is called Sri Panchami where “Sri” refers to her as another aspect of the one goddess Devi. This day also marks the occasion when Parvati approached Kama to awaken Shiva who is in yogic meditation since Maha Shivratri. This year Saraswati Puja, Vasant Panchami will be ceebrated on 22nd January. Be the first to comment on "Basant Panchami, Saraswati Puja 2018: All You Need To Know"